Do you have a favorite drink you crave? My cool and refreshing spring-loving drink favorite comes from a mega-craving I had when I was pregnant with my son. We lived right down the road from a Sonic, and I would go frequently to get a large Cherry Limeade. Nothing else… just the Cherry Limeade. Then, we moved away to New Jersey, and the area that we lived in had no Sonic. What’s a girl to do? I guess I must have just suffered through it… even though I’m sure I had those Cherry Limeade cravings again in my second pregnancy. Thankfully a trip to Arkansas, where there are many Sonic locations, helped me out for a week or so. And then a move to TX, with a Sonic right down the road. Did I mention my husband was Air Force… hence the moving all over the place. Along the way, I learned how to make a super refreshing Copycat Sonic Cherry Limeade that is SO good. And now that we’re in Wisconsin, even though we could head down the road to our new local Sonic, we make them more often at home. My daughter makes them on her own now, because it is that easy and they are that good. 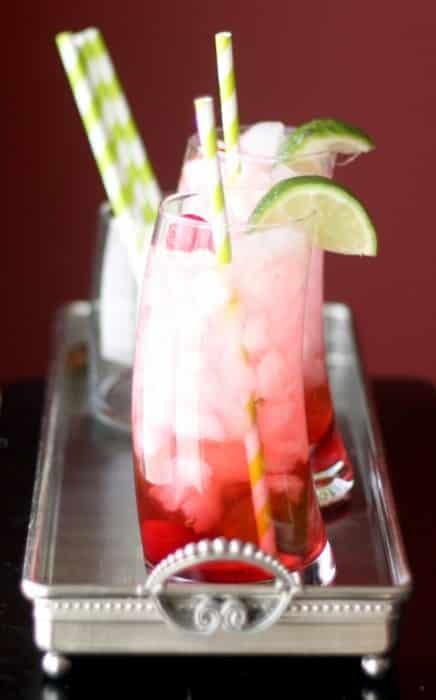 This spring and summer time drink requires just a few ingredients, is a fun and festive drink to mix up for a luncheon or even a children, tween or teen’s party. Call it a mocktail, call it a virgin cocktail, call it a cherry limeade. It might be a copycat, but its 100% delicious, and we wouldn’t have it any other way! Pour Maraschino syrup in bottom of glass. Cut lime in 4 pieces. Squeeze juice of 1/2 lime into glass. Drop lime pieces into the glass and a couple of cherries. Cover ice with lemon lime soda. Garnish with lime sliver and another cherry on top if desired. I was going to stop a couple days ago and get a Sonic Cherry Limeade and didn’t for some reason – I don’t know why I am still craving one – I think I need to put some maraschino cherries on my grocery list and limes so I will have what I need – oh and some soda I don’t usually have much of that in the house. I do believe I was with you when I got my first cherry limeade! One of my favorite drinks at Sonic too 😉 Love that you can make it at home – and love those glasses!!! Thanks for sharing your copycat recipe! I always crave Cherry limeades! Yumm! This sounds great. I, too, have a cherry limeade dependency program. There is a sonic only 3 miles from here, but I can’t always make it during their happy hour when drinks are half price, so I don’t get one very often. Now, I can whip one up whenever I want. Thank you. This sounds very refreshing, I love the colour! Thanks for linking up to Sweet and Savoury Sunday, stop by and link up with us again this weekend, I’d love to see you there Have a great weekend! Hi Jessica! Can you believe I’ve never had one of these? They just opened a Sonic near me, but I would rather try yours – it looks so delicious and I love your glasses! Thank you so much for sharing at Best of the Weekend – pinned a couple of times! 🙂 Hope you have happy and fantastic week! This looks and sounds entirely delicious. I am slightly obsessed with maraschino cherries, I’ll have to look for the syrup the next time I am at the supermarket. I haven’t had a limeade in YEARS!! For some reason Sonic isn’t abundant in New England like when I lived in NC. 🙁 Thanks for sharing at The Mommy Club Link Party. My MIL loves this drink! To think, I had never even eaten at a Sonic before I moved to Texas…now they’re part of my daily landscape!